Kerry's Patrice Diggin and Julianne O'Keeffe celebrate and inset the starting team for the Division 3 final against Roscommon all made up of Clanmaurice players. 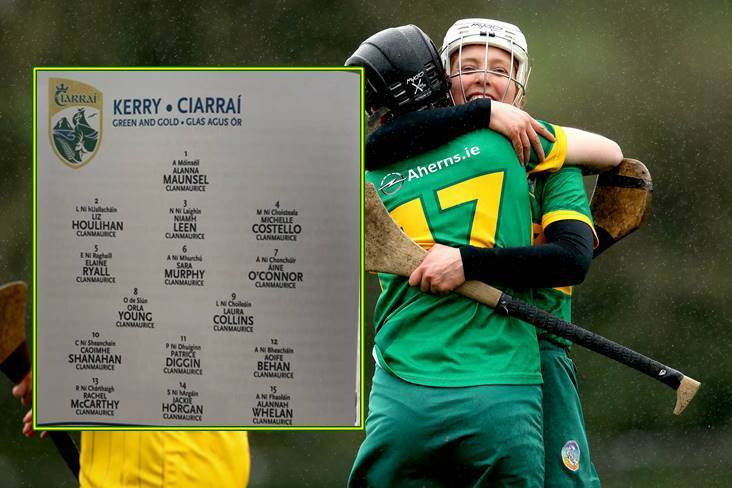 A remarkable feature of Kerry's National League Division 3 Camogie final victory over Roscommon yesterday was that all 29 panel members play for the same club. Stephen Goggin's squad was made up entirely of players from Clanmaurice, which is the only adult club in the Kingdom. The squad contained three players from Causeway (Katylyn O'Connor, Kate Buckley and Clodagh Walsh) and one from Cillard (Brid Horan), but those two clubs only field at underage level. The Kerry squad for the Division 3 final against Roscommon. The 2-8 to 0-4 victory at the home of Tipperary camogie in The Ragg made up for the disappointment of Clanmaurice's defeat to Meath's Kilmessan after a replay in last December's All-Ireland club junior camogie final.